After meeting your crew, we travel east and make our way to neighbouring Botswana and the Kalahari Desert. 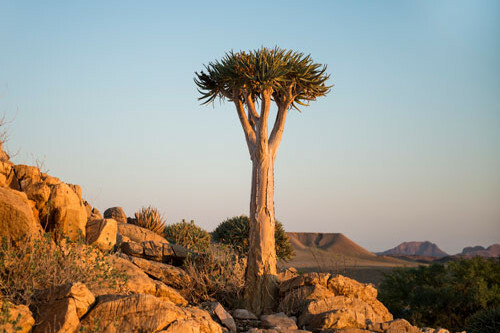 Starkly different to the Namib Desert after which Namibia is named, the Kalahari is no less dramatic and covers over 900 000 square kilometres. The San people have long been associated with this harsh environment and tonight we enjoy a dance evening that provides an insight into their culture of song, dance and storytelling. Before departing Ghanzi we will enjoy an informative guided walk with the San community, this is an opportunity to learn more about the San culture and interaction with their Desert environment. After our walk, we head towards Maun, where upon arrival in Maun this afternoon, you will have the opportunity to go on an optional scenic flight over the Delta (time and weather permitting). This evening our guide will prepare us on what to expect on our full day excursion into the Okavango Delta. 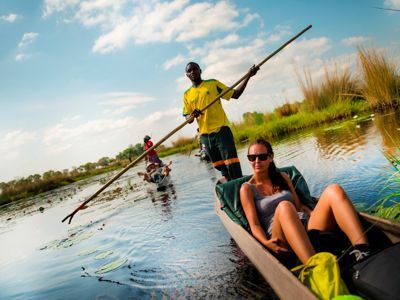 Those guests who have pre-purchased the upgrade package – will board the flight into the Delta upon arrival in Maun and will re-join the group on the morning of day 4. 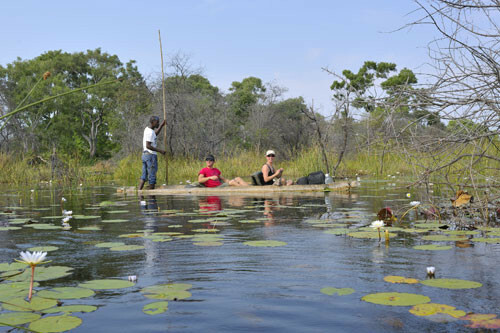 Please speak to your consultant for your programme for your Okavango Delta Excursion. The most rewarding and enjoyable way to explore and experience the beauty and serenity of this intricate system of lily covered channels and lagoons is by mokoro. Heading out early, we will be transferred by safari vehicle to the poling station (approximately 1 hour transfer) where we will meet the polers who will be escorting us into the Delta. The polers will steer us through the serene area of narrow, reed lined channels which open out onto beautiful lagoons. Reaching one of the many islands, a nature walk may be taken with your poler. After the walk, we return by mokoro through the channels back to the mooring station. 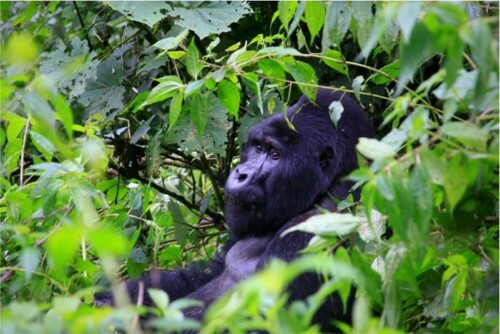 While the mokoro trail is not primarily a game viewing activity, a variety of game bay be spotted in this pristine wilderness area including elephant, giraffe, kudu, impala and zebra. Leaving Maun behind us this morning (and re-uniting with those that chose the upgrade package) we make our way towards the town of Nata. We will spend most of the day in our truck as we journey across the northern reaches of the Makgadikgadi Pans. Our activity package will afford the opportunity to enjoy an afternoon guided game drive to the Nata Sanctuary, which forms the breeding ground for a host of water birds including pelicans and flamingo in their thousands. We rise early this morning as we continue north to our camp on the banks of the Chobe River. This afternoon is set aside for exploring the Chobe National Park. We begin our exploration in 4×4 vehicles, which allows us an up close and personal experience with the many elephants that frequent the river. The afternoon ends with a leisurely boat cruise and a meal served around the campfire. With the memories of our wildlife encounters firmly etched in our minds, we cross the border in Zimbabwe this morning and travel the short distance to Victoria Falls. Today you have the opportunity to visit the spectacular Victoria Falls, also known by the local name of “Mosi-oa Tunya” (the smoke that thunders). While much of today is dedicated to viewing the mighty Zambezi River as it drops into the Batoka Gorge below, the bustling adventure town of Victoria Falls also offers a range of optional activities for those wanting a dose of adrenaline in the afternoon. For the more relaxed traveller there are craft markets and coffee shops on offer as well. Tonight we enjoy an optional dinner out, your guide will assist you to decide on the many options available.